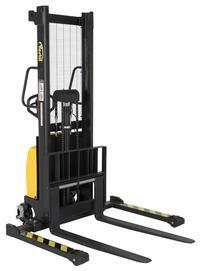 An economical alternative DC powered lift stacker. Ideal for maintenance and commercial applications. 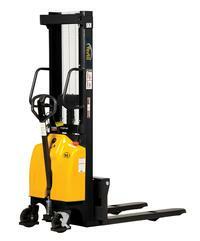 This unit can be used as manual hand pump lift or electric powered lift (Pic. 2). Ideal when power is not available. High quality hydraulic pump and DC lift system. Compact design and strong steel profile construction. 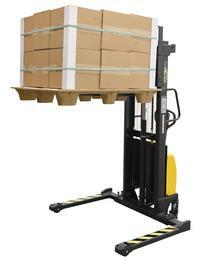 An economical lift to handle tasks such as transporting dies, molds, and skids (Pic. 3). Powered with two (2) 12V, 40Ah batteries. Integral battery charger, battery level gauge (Pic. 4), and adjustable lowering speed. All models are easily maneuverable using the standard series pull handle. Individual forks are 6" wide.